This document describes the cloning of individual targeting plasmids (as opposed to library cloning). DECKO employs a 2-step cloning methodology. 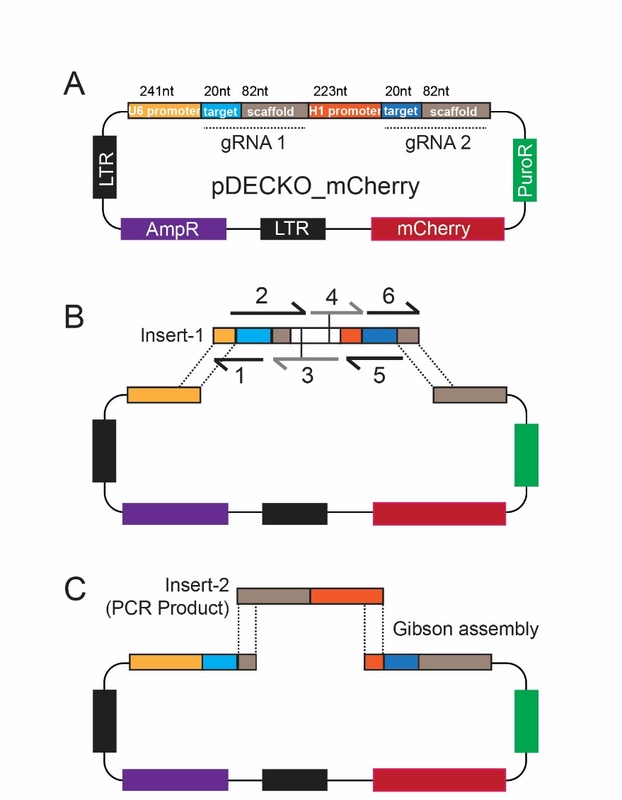 Cloning is based on the Gibson assembly method, which avoids conventional ligation and enables multi-fragment assembly. In Step 1, multiple oligonucleotides are assembled together with the Backbone plasmid to create an intermediate plasmid. In Step 2, a constant "Insert-2" fragment is inserted within the new sequence created in the previous step. Insert-2 sequence can be amplified by PCR using oligos and Template plasmid described below. The time required for the complete cloning is about 5 days. Fig. 2. Detail of 6 oligo assembly example.